How do you teach a group of robots to get along? Researchers are looking to animals for inspiration. From ants to zebras, animals that work and travel in groups have honed their ability to communicate messages to each other quickly. Today, the emerging field of swarm robotics seeks to mimic these animal behaviors. These swarms of small, simple, inexpensive robots could drastically change how we use robotics in many aspects of our lives, from laser shows to deep space exploration. At the University of New Mexico, researchers are drawing inspiration from harvester ants’ ability to gather seeds in order to make robot swarms more efficient at collecting resources or information to complete a task. They put a swarm of six robots through a gauntlet of scenarios aimed at maximizing the amount of resources that the group can bring together in a fixed amount of time. The time limit forces the swarm to prioritize where to search in the same way ants focus on areas with the most food first. Like ants using pheromone trails to guide one another to the next feeding spot, the robots must head back to a central ‘nest’ to find out more information about where other resources are by communicating with a laptop. Like ants, these robots search the area for their ‘food’ – actually barcodes they scan and bring back to their central ‘nest.’ Along the way, they’ll scan the area around them to ensure they’re not collecting from the same areas as the other swarm members to maximize their efficiency. Other researchers design their swarms to have truly decentralized behavior — that is, they wouldn’t report to a central computer. Guillaume Sartoretti, a member of a robotics team at the Ecole Polytechnique Federale de Lausanne in Switzerland, compares decentralization to a flock of birds in which each bird can only see the ones nearby. These swarms have no centralized laptop to report back to. Instead, each robot in a swarm of eight gathers information based only on what it can see. The robots can nonetheless maintain a cohesive group by keeping a fixed distance from their neighbors, even without being able to see the entire swarm. The team at the Ecole Polytechnique Federale instructed their swarm to find a path circling the light without colliding with one another. In multiple tests, the robots accomplished this without any direct communication with each other. Scientists are working on other swarms that attempt to behave like birds or fish, but these face additional problems, mostly because they need to function in midair or underwater. Underwater, fish use a complex system of sights, sounds and pattern movements to signal a threat and avoid it as a group, says Claudio Moriconi, a researcher at the Casaccia Research Center in Rome. His team has developed simulations that can mimic many of these behaviors by allowing direct communication between individuals. 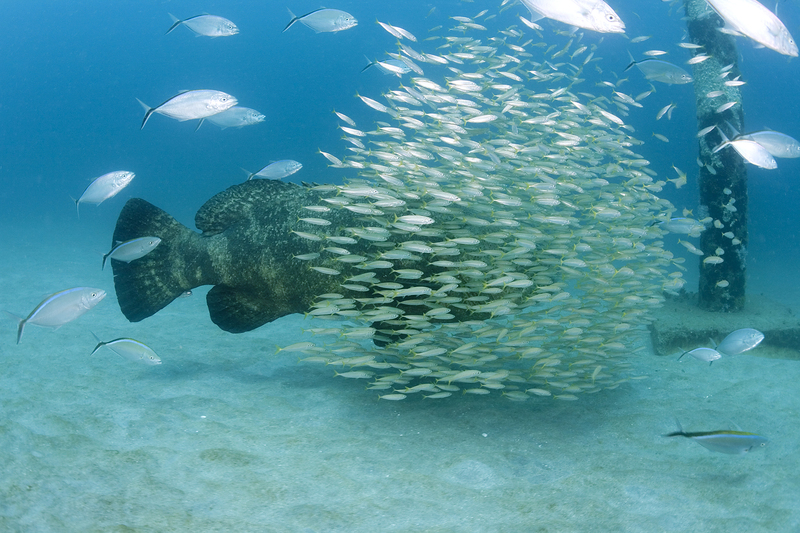 Compared to actual fish, though, these simulated swarms react sluggishly to a threat. But when properly developed, these swarms will open up new frontiers, Moriconi believes. Aquatic swarms, he adds, will allow us to explore — and eventually live — in underwater environments, by doing anything from detecting pollutants and monitoring fish populations to repairing extensive undersea infrastructures. A team from Eotvos Lorand University in Budapest, Hungary, faced similar challenges when testing its flying swarm. Biological physicist Csaba Viragh says the team began by implementing three rules governing a flock of birds: stick together, fly in the same direction and don’t hit each other. They used GPS data to notify swarm members where their neighbors were, although sometimes the signals received were as old as 1.5 seconds. With such slow communication, the drones are not yet as coordinated as a flock of birds. Despite this, Viragh says, the drones are able to fly without hitting one another. The next step, Moriconi says, is to develop higher communication levels, what he calls a true swarm intelligence. Rather than develop a swarm where each robot has individual — but limited — intelligence, he says the goal should be a large number of robots that share a unified brain. “We are really intrigued,” he says, “by the possibility to exchange memory, learned facts and, in general, high-level communication.” In other words, each individual would be able to draw on the same pool of information shared by — and within — the entire swarm. The team at Eotvos Lorand University has already found a use for their swarm in dazzling performance art, proving that not all of these robots will be used for industrial applications. Originally the article stated that the drone flock from Eotvos Lorand University was in danger of collisions during tests. The flock did not experience collisions.